Reaction to Alan Davey’s appointment as controller of BBC Radio 3 has been predictably facile. The Guardian fulfilled its role as part of the BBC PR machine with a sycophantic piece by arts editor Charlotte Higgins titled Alan Davey: why Radio 3 have hired well in this former punk enthusiast. 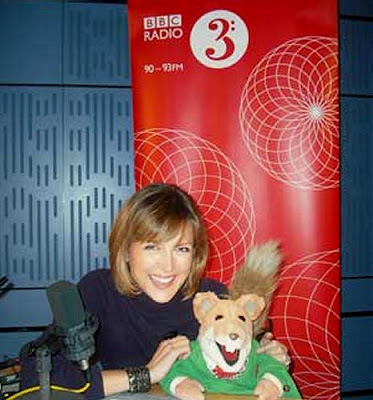 It takes a lot to reduce me to tears of laughter, but Ms. Higgins assertion that “Within the BBC itself, audience figures are not the main priority for Radio 3” certainly had tears of mirth rolling down my cheeks; as did her assertion that Alan Davey’s appointment was justified by the size of his CD collection. In the opposing camp, Norman Lebrecht’s outpouring of vitriol suggests that the designate Radio 3 controller dented Lebrecht’s Rolls Royce in the Arts Council car park at some time in the past; either that or Lebrecht craved after the post that Davey was appointed to. Among the fence sitters, the self-styled Friends of Radio 3 used the appointment of a new controller to express - for the umpteenth time - the hope that the classical network would revert to its former name of the Third Programme and that the presenters - sorry announcers - would once again wear dinner jackets while on air. Missing from the coverage by industry experts was one glaringly obvious fact - that the name in the frame is far less important than what is happening around the frame. Despite Charlotte Higgins’ risible assertion, the reality is that BBC Radio 3 needs an audience more than the audience needs Radio 3. Because new digital technologies in the form of mobile audio players, internet radio, audio-on-demand and, above all, music streaming, have made one-size-fits-all classical radio as perpetuated by Radio 3 and its role model Classic FM redundant. There is no mass market for classical music. What comes under the umbrella heading of classical music is actually a granular agglomeration of diverse but overlapping niches, and the new digital distribution channels enable listeners in all those different niches to very precisely personalise their listening. Classical radio audiences are not falling because classical music has become less appealing. They are falling because BBC Radio 3 and virtually every other classical radio station has chosen to ignore the increasing fragmentation of audiences, and, instead, has pursued a futile strategy of chasing a non-existent mass audience with one-size-fits-nobody programming. The reason why classical radio lost one million listeners in twelve months in the UK is that the early and mid-adopters of new digital distribution channels have abandoned traditional radio, and all that is left is a fast diminishing rump of technology late-adopters. There is a future for classical radio; but only if the medium wakes-up to what is happening in the real world. Bland one-size-fits-nobody programming must be abandoned, to be replaced by granular niche content that adds the value of authority to the anonymous streaming that is fast becoming the distribution platform of choice. The rapid uptake of audio-on-demand apps such as iPlayer means classical radio has become an alternative form of streaming, and the big opportunity for BBC Radio 3 is to position itself as the primary source of rich niche content accessed both by real time broadcasting and streaming. The current wall-to-wall easy listening programming must be replaced by a matrix of challenging and informative niche content - early, contemporary, sacred, world music, drama etc - edited and presented by people who know what they are talking about. But that will require a sea change at Radio 3: because among the many things lost from the station during the dark years of Nicholas Kenyon and Roger Wright has been authority, with knowledgeable and opinionated contributors such as Leo Black, Robert Simpson and Hans Keller being replaced by ex-Classic FM celebrity classical jocks such as Petroc Trelawny and Katie Derham. (The Guardian revelation that Petroc Trelawny was a contender for the Radio 3 controller post also reduced me to tears, but they were not of laughter). Charlotte Higgins has never been more wrong when she opines that at Radio 3 Alan Davey should “not rock the boat too much”. All objective measures show that Radio 3 is holed below the waterline and sinking fast. As I am not a beneficiary of the BBC’s considerable largesse, and as my Rolls Royce hasn’t been dented recently, I am not going to express a view on whether Alan Davey is the person to save the sinking ship. But what I do know is that it will take more than a very large CD collection to allow Radio 3 to survive the transition from the old world where it had a virtual monopoly on broadcast classical music, to the new world where Radio 3 is just another player on a large, crowded and not very level playing field. Header photo first appeared in Do the arts need wide or deep audiences? Any copyrighted material is included as "fair use" for critical analysis only, and will be removed at the request of copyright owner(s). Also on Facebook and Twitter. "Bland one-size-fits-nobody programming must be abandoned, to be replaced by granular niche content that adds the value of authority"
Friends of Radio 3 don't really say that Radio 3 should be called The Third Programme; or that presenters must be called announcers; or that they should wear dinner jackets when on air, do they? I don't think the link you gave supports that either, does it? In fact, they've never said anything like any of those things, have they? Yes, we are sitting on the fence because the new controller doesn't start work until next January so we reserve judgement on what he will do. Sarah, if I have misrepresented the position of Friends of Radio 3 (FoR3) it is because I, and I suspect many other people, have no idea of what the position of your organisation is on the future direction of Radio 3. In recent years I have become increasingly concerned about how FoR3 has presented itself as a quasi-official body representing the station's listeners. According to your website you have "approaching 900 supporters", whereas Radio 3 has almost two million listeners. How can FoR3 in any way be representative of listener's views? My view, and remember On An Overgrown Path is a personal blog, is that the positioning of FoR3 as the quasi-official body representing listeners has actually helped the BBC push through damaging reforms to Radio 3, because FoR3 is seen to be lacking teeth, both in numbers and strategy. In my post I express a clear opinion on the future direction Radio 3 should take - "The current wall-to-wall easy listening programming must be replaced by a matrix of challenging and informative niche content - early, contemporary, sacred, world music, drama etc - edited and presented by people who know what they are talking about". It would help me and my readers - whose number, incidentally, is many times greater than that of your supporters - if you could in the same way explain the future direction that FoR3 advocates for Radio 3. Pliable - I've just spent some time replying to the email (which I thought was your reply to mine), then saw it was a no-reply address and referred to your post here. A couple of points that surprise me: I'm not sure how or where we present ourselves as 'quasi-official' since we are clear we aren't connected with either the BBC or Radio 3. Nor do we represent anyone but ourselves: that is, the 'registered' supporters who have contacted us directly to say they support our approach and with whom we keep in regular contact. The one thing that seems to make us unique among the various individuals and groups who broadly fall into the 'dissident' camp is that we have elected to engage directly with the BBC, as a strategy. That doesn't make us any more official than any individual who writes in to complain about anything. The BBC lumps us in with the 'stakeholder organisations' - we are semi-organised - but that doesn't make us any different from the Voice of the Listener and Viewer or the Incorporated Society of Musicians who put in their submissions when invited. One difficulty over giving a detailed résumé of our views on how Radio 3 should evolve has been a doubt as to how prescriptive we ought to be about what it does and how it should do it. A starting point would be to be clear what it is that radio can do that other media can't: for Radio 3 it's not as simple as 'providing music' in some way or another: it is about building up an informed audience. That needs focus and experts. The current Radio 3 has neither the programme formats nor the experts to do this. For all music (classical, jazz and world) and for the spoken arts/discussion, it's about serving an audience that has a strong enough interest, or new curiosity, to explore the areas more deeply. Is it for us to explain how the producers do it? "I'm not sure how or where we present ourselves as 'quasi-official'". FoR3 presents itself as quasi-official in the sense of mandated and representative. This impression is given from the FoR3 website and, particularly, in the organisation's dealings with the press. The 2014 Telegraph article linked at the end of this comment describes FoR3 as a "lobby group" and says "2003 Friends of Radio 3 formed to press for preservation of its standards". It is my view that FoR3 has passively exploited - particularly with the press - the misconception that the organisation represents the views of everyone who is concerned at Radio 3's lack of credible future direction. I am afraid your response does nothing to enlighten me as to the future direction that FoR3 advocates for Radio 3 other than pressing for the preservation of its standards - dinner jackets or otherwise. Your observation that "The current Radio 3 has neither the programme formats nor the experts to do this" is not a strategy or a way forward, it is a statement of the blindingly obvious. For what it is worth, this former Radio 3 listener views FoR3 as part of the problem, not part of the solution; because your organisation fails to accept that, as per the title of this post, classical radio must change or die. Lets end this comment thread here before we go over the same ground for the umpteenth time. Coincidentally, I am currently in France and this post was written there. Radio France Musique is currently my default radio station, as it has been during my many stays here. Sadly I cannot share the previous commenters enthusiasm. RFM has its good points; but in recent years it has adopted the same one-size-fits-all format of too much talk and not enough content that blights BBC Radio 3. Longtime reader Antoine Leboyer summed it up a few years back. Question: how do you know you are listening to France Musique? Answer: it is the station with no musique. The Canadian Broadcasting Corporation has pulled off the trick of making BBC Radio 3 look quite good. No mean feat. Classical music is now almost entirely restricted to working hours, Monday to Friday, and consists of short works and bleeding chunks hacked out of longer, all introduced by twitterers. I didn't realize until I looked at that last word how little I need to expand upon it. When I discovered the site 'Classical Live Online Radio', with links to around 160 classical stations worldwide, I tried many indeed. Some, as in the case of France Musique, I dismissed quickly, others I thought good or excellent. But the one that has long been my default is RAI5 from Rome. Complete works, some shorter, most longer, Hildegarde to Ligeti, and many, many concert performances from RAI's wondrous archives. All linked only by the euphonious voice of an announcer giving the title, composer, and performer(s). To echo a point made by you, Bob, if there is to be more talk than that, we need the likes of Hans Keller, et al., to furnish it. Giving a work a meaningful introduction on radio is much akin to writing concert programme notes. That is a very difficult thing to do, as I know. I used to do it, and the only reason I have to think I may have done a good job, at least once, is that the notes I wrote for a concert in Vancouver received a drop of praise from the people at the Chicago Lyric Opera. I'd need more than one review to be convinced, so tough a task is it. Having little space or time to communicate something helpful to an audience requires much thinking and little writing. On the BBC and CBC there is neither, I suspect, but certainly no thinking. What we are stuck with are the mostly extempore twitterings of rank dilettantes.